The PS2200-2mil-2201SS-6mo-pi defines the electrical and mechanical characteristics and requirements for a continuous-duty single-phase, solid-state, uninterruptible1980 watt output ups. Power system utilizing Powerchute shutdown software powerchute. will provide high-quality AC power for sensitive electronic equipment loads at 1980 watts output. 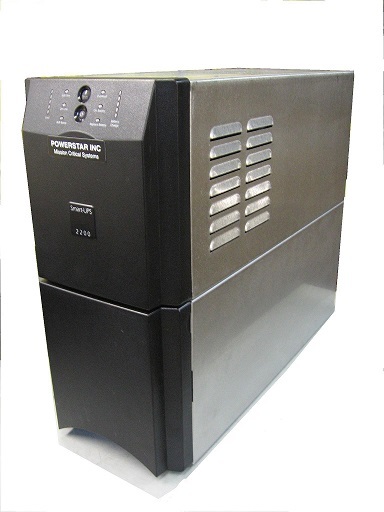 The UPS is designed to operate as a uninterruptible power supply in the following mode at 1980 watts output. A. Normal - In normal operation incoming AC power is fed to the input, conditioned and applied to the connected equipment. In this mode, power is also derived from utility power for the battery charger. In the event of a utility outage or severe abnormality (sag or swell), the UPS will support the connected load from battery power, until the battery is discharged or the utility returns; whichever occurs first. B. Battery - Upon failure of utility / mains AC power, the critical AC load is supplied by the battery. C. Recharge - 3 hours to rechargeUpon restoration of utility / mains AC power, after a utility / mains AC power outage, the input converter automatically restarts and resumes supplying power to the connected load and the battery charger to recharge the battery. D. Automatic cold Restart - Upon restoration of utility / mains AC power the UPS automatically restarts and assumes supplying power to the critical load and the battery charger. E. An optional manual bypass switch allow you to bypass the ups to keep the power going in emergencies. · 2200 VA/1980 Watts at 0.9 lagging power factor ..
C. Internal Battery: Valve regulated, non-spillable, flame retardant, lead acid cells. both regular and premium hi-temp versions are available or PREMIUM hi temp long life battery 8-12 year life. E. Battery Recharge: The UPS contains a battery recharge rate designed to prolong battery life. Recharge time for UPS internal batteries is three (3) hours maximum to 90% capacity after a complete discharge into full load. A. Voltage Configuration: The UPS operates at 120 VAC nominal; single phase without drawing power from the batteries. The input voltage can be adjusted to operate within the range of 74-154 VAC. Surge energy rating is 880 Joules, . Full time multi pole noise filtering; 0.3% IEEE surge let through; zero clamping response time. B. Voltage Regulation: + 3% steady state. C. Frequency Regulation: 47-53 Hz nominal for 50 Hz, 57-63 Hz nominal for 60 Hz, Synchronized to utility / mains. E. Output Power Rating: 2200 VA/1980 Watts at 0.95 lagging power factor. · Operating: 0O C to +40 C (+ 32O F to + 104O F) for altitudes 0 to 3000 meters (0 to 10,000 ft.) above sea level, or batteries can be upgraded to 60DC with 10 year life. · Storage: -15O C to +50O C (+ 5O F to +113O F) with batteries removed. · Storage elevation 15000 M max. · 20O C (+ 68O F) for optimum battery storage. · Storage: 0 to 96% non-condensing. Noise generated by the UPS under normal operation does not exceed 50dBA when measured at 1 meter from the surface of the UPS. The UPS is able to withstand an electrostatic discharge compliant to ENC61000-4-2, level 4, for 120 VAC, 208 VAC, and 230 VAC units (15 kV through air, 8 kV contact) without damage and will not affect the connected load. The specified UPS system is supplied with one (1) user's manual. per iso9000 Before shipment, the manufacturer fully and completely tests the system to assure compliance with the specification. These tests include operational discharge and recharge tests on the internal battery to assure performance. The UPS is manufactured and fabricated in accordance with ul class A, MIL-STD -901D and MIL-STD-167,mil 461 as tested and certified. The shell is stainless steel 304, and louvered to guard against leakage or drippage. All materials and components making up the UPS are new, of current manufacture, and have not been in prior service except as required during factory testing. All relays are provided with dust covers. Wiring practices, materials, and coding are in accordance with the requirements the standards listed in section 1.2 and other applicable codes and standards. All wiring is copper. The UPS unit is comprised of: input converter, battery charger, inverter, and battery consisting of the appropriate number of sealed battery cells 4 12v 17 ahour ; and is housed in a tower NEMA type 1 enclosure and meet the requirements of IP20. The UPS cabinet is cleaned. Chassis is fabricated from 304 stainless steel. It can be passivated as can all of your units. The UPS is forced air cooled by internally mounted fans. Fan power is provided from the internal power supply. Air intake is through the front of the unit and exhausted out the rear of the unit. The UPS has built-in protection against under voltage, over current, and over voltage conditions including low-energy lightning surges, introduced on the primary AC source. The 120 VAC models can sustain input surges without damage per criteria listed in IEEE 587 CAT. A & B. The UPS contains a battery recharge rate designed to prolong battery life. The battery is constant current charged to restore capacity, then shall be constant voltage charged to maintain the battery in a fully charged state. Recharge time for the internal UPS batteries shall be three (3) hours maximum to 90% capacity (full load discharge rate). There is DC over voltage protection so that if the DC voltage exceeds the pre-set limit, the UPS will shutdown automatically and the critical load is transferred to bypass mode. The UPS employs electronic current limiting circuitry. To prevent battery damage from over discharging, the UPS control logic automatically raises the shutdown voltage set point; dependent upon output load at the onset of battery operation. The UPS is provided with a microprocessor based unit status display and controls section designed for convenient and reliable user operation including internal diags. The monitoring includes functions such as status and alarm, battery level and runtimes. The UPS is provided with an automatic biweekly battery test feature (factory default). Via the set-up configuration program on a Windows based PC the automatic battery test can be disabled or configured to operate every 7, 14, 21, or 28 days. The battery test will ensure the capability of the battery to supply power to the inverter while loaded. If the battery fails the test, the UPS will display a warning message to indicate the internal batteries need replaced. The battery test feature is user accessible by the push button located on the front of the unit and with Communications Software. The Automatic Battery test feature is capable of being disabled through the User Configuration Program. Once overload condition is reduced, the load is automatically transferred back to inverter power. Valve regulated, non-spillable, flame-retardant lead acid cells are used as a stored-energy source for the specified UPS system. The battery is housed internal to the UPS cabinet, and sized to support the inverter at rated load and power factor, with ambient temperature of 25 O C (77 O F) for a minimum of 7 minutes reserve time. The expected life of the battery shall be 3 - 5 years or a minimum 250 complete discharge cycles. The UPS units have the capability to allow the operator to replace the internal battery. Output distribution is integrated to the UPS, and located on the rear of the unit. This option delivers SNMP and Web management to the UPS when connected to any 10 or 100 Mbit Ethernet network. The card supports 10 and 100 Mbit Ethernet and provides for in-the-field upgrade of SNMP firmware. The kit includes the card, software and installation manual. Once the card is installed, the serial communications is disabled in the DB9F connector. This RELAYCARD-INT option provides dry contact closures for remote monitoring of alarm conditions in the UPS, delivering signals for On Battery, Low Battery, Summary Alarm, UPS Fault and On UPS.